Awkward and bucktoothed as a child, Robert Ripley was plagued by shyness, which ultimately led to his passion for drawing and later traveling the world in search of strange and unusual people. He, too, knew what it was like to feel like an outsider, though as he grew older and became more of a household name, his money certainly propelled him from awkward outsider to suave ladies man, even if he never lost his bucktoothed smile. Robert Ripley's "Believe It Or Not" cartoons were the reality TV of his time. And despite the fact that he died in 1949, his empire continues to grow with Believe It Or Not! books and of course the Believe It Or Not Odditoriums all over the world. Neal Thompson writes an engaging, page-turning biography that despite the book's thickness, doesn't intimidate the reader and make them feel like to read it is to trudge through a bunch of boring, factual prose. I could see giving this book to a high school student who is a reluctant reader but loved (and maybe still loves) looking through the pictures in the Ripley's Believe It Or Not! books or flipping through the Guinness Book of World Records. This book would probably be a challenge for struggling readers and therefore I'd recommend it more for reluctant yet at or above grade level readers. I'd also love to see Thompson take this book and find a way to create a version for younger readers. 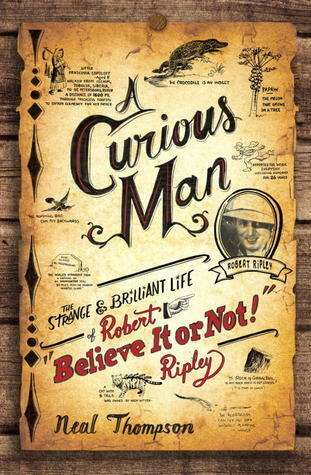 Since kids are now generally the audience for the Ripley's Believe It Or Not books, I think a biography of Robert Ripley would be an interesting reading ladder up for a lot of kids. In the mean time, A Curious Man is certainly a worthwhile read for anyone in search of a biography that will engage you and not bore you to death, as lengthy biographies have a tendency to do sometimes.